Smooth Stevia tastes great in coffee or tea, as well as in cold beverages including ice tea and smoothies. A pinch (50 mg) will yield the equivalent sweetness of a teaspoon of sugar; that’s the equivalent of ¹⁄32 of a teaspoon. It’s heat-stable and excellent for cooking and baking. Smooth Stevia is also beneficial for dental health, as its digestion is not initiated within the mouth, thereby not causing cavities. Low glycemic index. Be mindful of the dosage because: 1/32 tsp. 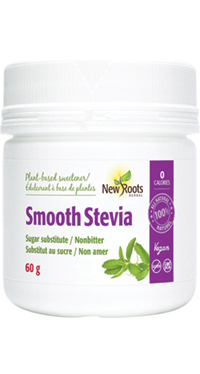 of Smooth Stevia = 1 teaspoon of sugar. Add to taste to your favourite beverage and stir. Excellent sugar substitute for coffee, tea, and for baking! Isomaltulose (naturally occurring disaccharide from sugar beet) and stevia (Stevia rebaudiana) concentrate. Not a significant source of saturated fat, trans fat, fibre, sugar, cholesterol, sodium, potassium, calcium, or iron.